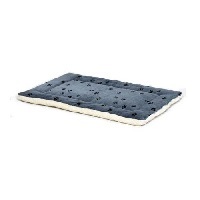 The Reversible Paw Print Dog Bed Mats are made with Ultra-soft Synthetic Fur on one side and Ultra-Plush Synthetic Sheep Skin on the other side. The dog bed mats are made with only the best quality materials and built to last. With every dog bed the question is how to keep it clean? We have the answer! These dog beds are machine wash and machine dry which takes the clean to a whole new level. These dog beds are great for use in carriers, vehicles, crates and more.